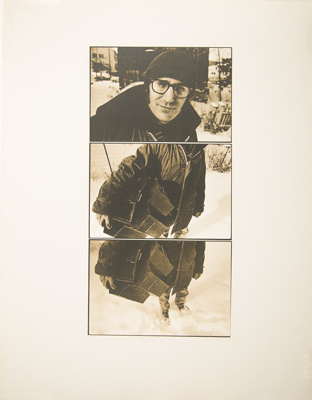 About this objectThree photographs of a man wearing winter clothes standing in the snow and holding boxes. The photographs are arranged in a way that gestures towards a coherent perspective but each photograph is taken from a different angle. This play with multiple images and perspective are characteristic of Wood’s work in photography. The dense blacks of the image are a result of the kodalith printing paper. The approximate date is informed by the date of similar work.